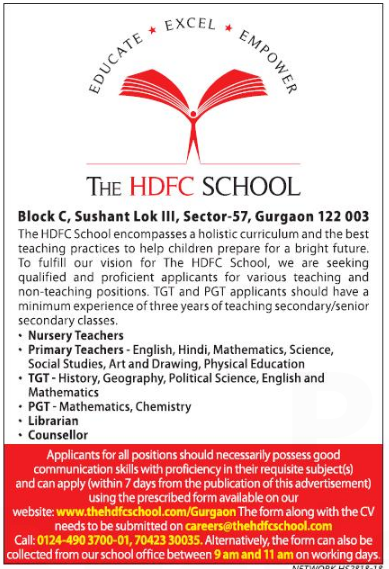 The HDFC School, Gurgaon has advertised for recruitment of Teaching Faculty- Teachers PGT / TGT / NTT / PRT jobs vacancies. Interested and eligible job aspirants are requested to apply within 07 days from 27th November 2018. Check out further more details below. About School: At The HDFC School, we are committed to be a friend, philosopher and guide in your child's 'learning journey' by providing Education that leads to Excellence which in turn paves the path for Empowerment. We give learning opportunities that enable your child to grow and develop in a holistic manner, create an environment for inquisitive, intellectual, innovative minds and instill the joy of learning through cooperation and collaboration. How to Apply: Interested and eligible candidates are requested to collect prescribed application form from school office between 9 am to 11 am on all working days or downloaded from school website www.thehdfcschool.com/gurgaon and send filled form along with CV, copies of certificates, PAN card, Aadhaar card and PP size photos to the email address given below.